White Wolf : Elder Irene Young of Opaskwayak Cree Nation shares teachings on the four sacred medicines. 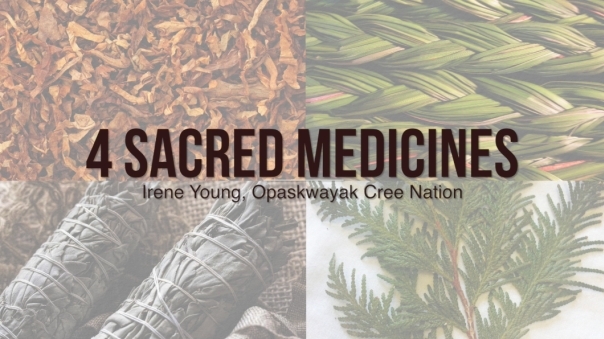 Elder Irene Young of Opaskwayak Cree Nation shares teachings on the four sacred medicines. Health isn't just about your physical well-being. It also includes your emotional, mental and spiritual wellness. For a person to be truly healthy, all aspects must be taken care of. This holistic approach has long been a part of many Indigenous philosophies, although this method is still not part of Western medical science and healthcare. But as we see more Indigenous doctors, health care professionals and healers enter the field, so too do we see the return of the medicine wheel. Like Sage and Sweet grass, cedar is used to purify the home, it also has many restorative medicinal use. When mixed with sage for a tea, it cleans the body of all infections, cedar baths are also very healing. Cedar is used in sweat lodge and fasting ceremonies for protection, cedar branches cover the floor of many sweat lodges and some people make a circle of cedar when they are fasting. It is a guardian spirit and chases away the bad spirits. Responses to "Elder Irene Young of Opaskwayak Cree Nation shares teachings on the four sacred medicines." on the topic of my presentation subject, which i am going to present in school.